I loved this book. I thought it was way better than the movie. I loved all the little cultural details as well ... so interesting! I agree with the first commenter: I loved the book, but the movie paled in comparison. If you want to read another Asian-themed historical fiction I'll cautiously recommend "The Red Queen" by Margaret Drabble. I say "cautiously" because the author employs the device of combining two stories into one book, and the historical element rocks while the present day element totally bites :) Don't spend money on it, but if you can borrow it from a library then it offers a fascinating/harrowing look into the life of a woman who becomes part of the royal family in Korea. 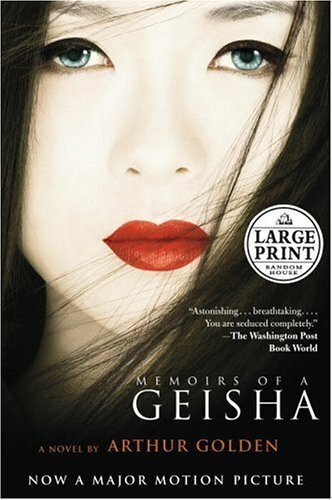 I must second the comments above me, I loved Memoirs of a Geisha. It's so beautifully written with such vivid details. I'm glad you enjoyed it. I haven't read this yet - I started it once and somehow didn't pick it up again. I don't think I timed it right. But I still have it, and will give it another go! I also have not seen the movie, because I haven't read it yet. I just finished this book about a month ago. I loved it, too! Golden did write amazingly well, although there were a few passages where it sounds a little like an encyclopedia--but I'm glad he explained things, even if it could've flowed better, because I learned so much from it! I am so glad you said you weren't as big a fan of the ending! I read this a few years ago and was so infuriated by the end that I chucked the book at my wall. I was mad and felt cheated. I feel like I should give it a second chance, but it left a sour taste in my mouth. I have yet to read the book. But I watched the movie when I was in college. I hated the ending of the movie. People have been telling me for years that the book is so much better. I've even pulled the book off the library shelf twice only to put it back. But now I think I'm going to force myself to take it home and read it. I usually like books better than films anyway. I remember just loving this book; I should read it again. Great review! The Japanese language and culture are very intricate and interesting. So glad that you appreciated this novel and I hope you enjoy the movie as much as I did. It was the first time I read a book about Asia. And I liked it. I learned a lot of things about geisha, and what they really are. I didn't see the movie, but if I could I would. This book always comes to mind when I'm asked what my all-time favorite books are. I love a book that teaches me about history and cultures and customs of other countries. I agree, that was the best part of the book. Thanks for the great review! Made me want to read it again.